The Australian landscape is pretty varied - everything from barren desert to lush rainforest. Although it has many different types, there is one feature that distinguishes all but the most barren regions. This feature stands out and makes Australian landscape photos instantly recognisable - it's the trees. 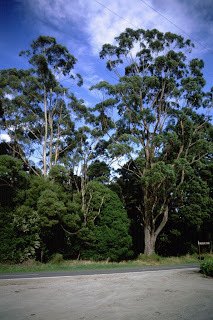 Eucalypts are a kind of tree that has really thrived in Australian conditions and their distinctive shape with tall, sinuous trunks and almost clumpy masses of slender drooping leaves are the thing that make even the greenest of Australian landscapes distinct from pictures of European or American countryside. The picture on the right was taken on the Great Ocean Road in Southern Victoria. Which is one of the reasons why I always get a bit freaked out when I visit the Bay Area. Eucalpyts seem to have been introduced quite freely in some parts - including avenues of paperbarks (which are actually melaleucas, not eucalypts but then I never claimed to be a botanist) along stretches of "the" El Camino Real. If it was only a little warmer I could believe I was back in Sydney!